No doubt, You must be aware that Google tracks you, but what you probably did not realize is how precisely and till what extent it tracks you. Well, Google knows which movies I watched where, when, at what time and with how many of my friends, and knows it so well — even my eyebrows raised slightly in surprise! If you are using your Gmail account like I do, receiving all movie booking and tickets, Google can easily track your movie flavors and frequent hangout places without access to GPS. I was feeling bored last night, so I decided to watch a movie and moved towards Google to search newly released films. 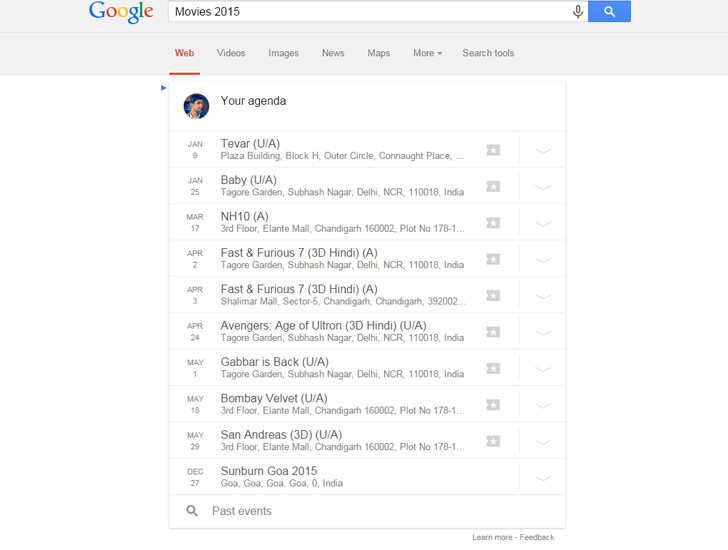 As I googled "Movies 2015"... Holy Crap! What I saw on the monitor was unbelievable. In Google search results, I was able to see the list of all my past movie booking event activities and even my future bookings (shown below), and it was so, so accurate. If you have Google account logged in into your browser, then just Google "Movies 2015" and you’ll have all your personal data on the computer screen, as shown. 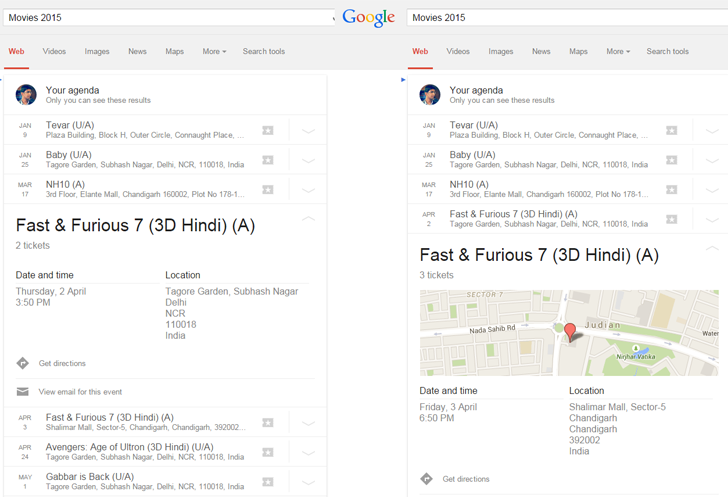 Google knows I had seen Fast and Furious 7 twice; first time on April 2nd in New Delhi with my office colleague and the second time on April 3rd in Chandigarh with my family friends. The Google Search Engine not just knows when, which and how many times I watched a movie, but it also collects all the data related to film, including number of tickets I had booked and location of movie hall with complete address on Google map. This absolutely scared me for a while, as in this scenario, neither I had used any GPS enabled device nor I had any intention to reveal my hangout plans to social media check-in. My family is not aware of it, but Google knows. So be careful with your laptop if you watch the same movie with different girlfriends, because, in case, one of your girlfriend see your laptop, you could be in tremendous relationship trouble. Ha! Just scaring you a bit, but this does not mean it could not be happened to you. No doubt, this private information is only visible to me as it is linked to my Gmail account, but the fact here is that out of thousands of official, personal, spam and promotional emails, Google is smartly and continuously listing out every piece of information related to my activities. This actually remind me of a statement made by the famous Media tycoon Rupert Murdoch who labeled Google worse than the NSA, when it comes to tracking, saying "NSA privacy invasion bad, but nothing compared to Google." How is Google able to track your activities so accurately without GPS? Well, Gmail does scan and read all your emails, clearly defined in its terms as their, "automated systems analyze your content." However, Google has faced criticism from privacy action groups and lawsuits from the education sector for these terms. Structured Data Markup allows website developers or email senders to add special tags to their existing HTML code, which in turn allow search engines to understand better what information is contained in emails or web pages. Email markup describes the details of organized events, such as musical concerts or art festivals, which people may attend at a particular time and place. Gmail support both JSON-LD and Microdata markup. For Example, If you are booking rooms from Hotels.com or flights from makemytrip.com or movie tickets from Bookmyshow.com, these sites will send you e-tickets formatted with email markup so that Google can easily scan and index them quickly for giving your alerts via Google Now service. Unfortunately, Such Scanning and indexing of emails cannot be entirely turned off by users. So, just make sure you don't hand over your laptop to any of your friends with your gmail account logged-in. Now as you guys know that I have booked tickets for Sunburn 2015, Goa, so catch you there. Stay Tuned, Stay Safe.